Guitar magazines are everywhere, and they seem to come and go as they please; however, Guitar World is the one magazine that has remained on newsstands for over 31 years. Buy a single copy or subscription to Guitar World magazine. 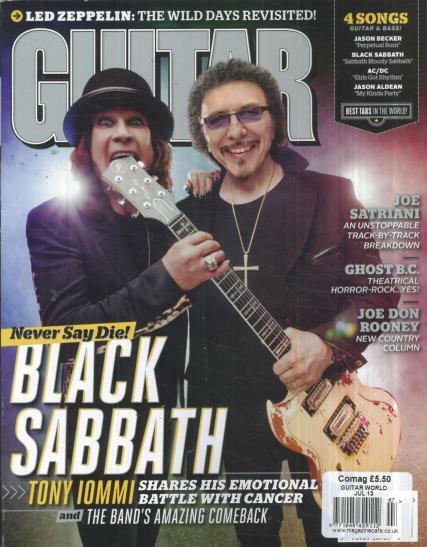 As one of the best publications covering everything related to the rock music genre, Guitar World stands alone as one of the magazines most read and owned by rock guitarists in the North America. It is a monthly magazine where each month features in-depth interviews, unique and exciting lessons and workshops, beautiful photography, and the latest articles full of interesting and newsworthy content. Many guitarists often have troubles finding decent and accurate tablature of their favorite songs, but with a subscription to this magazine, guitarists will be delighted to find five or six accurate and professionally verified rock music tabs in every issue. In addition to the availability of the accurate and in-depth tablature of favorite rock and metal songs, each issue also gives readers a strong guitar playing education, as the magazine is packed full of detailed lessons and workshops that are catered not only for beginners but also seasoned guitar experts, ranging from basic chord structure to advanced soloing techniques.